The Erie music scene is strong. And growing stronger. That makes the announcement of NPR's Tiny Desk Contest all the more exciting. Fans of the Tiny Desk Concerts know that its producers, as well as its audience, are music literate with a discerning palate for fringe pop and great introductions from Tin Pan Alley and beyond. Rising stars and established artists alike come into the NPR studios in Washington, D.C. and gather around, well, a tiny desk and a few microphones. If you're into American Idol and The Voice, this is probably not your concert or your contest. But allegiance does not have to be exclusive. To aid local contestants, the Erie Reader would like to invite local musicians with original music to use our tiny desk(s) to record your contest entry. 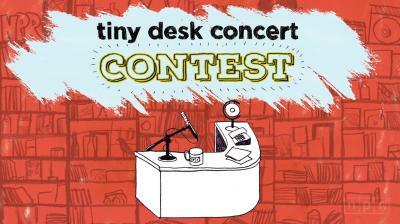 You have to adhere to the NPR Tiny Desk Contest rules, bring your own camera(s) and mic(s), but we'll supply the desk. So here's the deal. If you've got a tune, but you need a desk, email TinyDesk@ErieReader.com to schedule some desk time. Seats at the desk will be available in one hour increments and space is limited. Your performance must be uploaded to YouTube and submitted via the NPR contest form by January 19, 2015. So tick-tock Clarice, it's time to cut a song. The winning act gets its own Tiny Desk Concert at the NPR studios as well as a set at the Lagunitas 'Couch Trippin' to Austin' showcase in March. We know you've got it in you, Erie. We're willing to bet our desk on it.